February 4, 2019 (Last Updated: April 6, 2019) - As an Amazon Associate I earn from qualifying purchases. 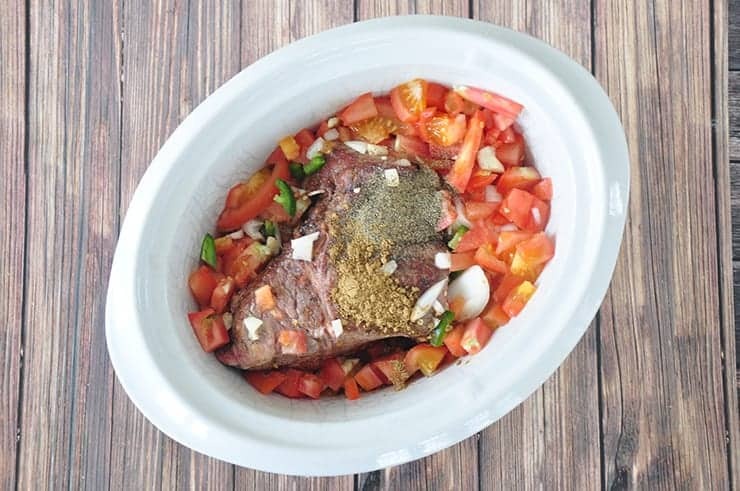 It is such a succulent and moist shredded beef recipe for your best Mexican dishes. 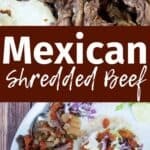 Whether you are making traditional tacos or classic enchiladas, this slow cooker beef is absolutely delicious. This shredded beef enchiladas and tacos filling has been in the crockpot all day and the smell in the air brings me so much happiness. 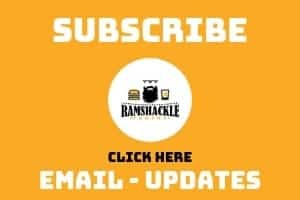 Whether you need a shredded beef recipe for our enchilada series or taco series, this will fit the bill and your house can have the same hearty and homey smells that mine do right now. 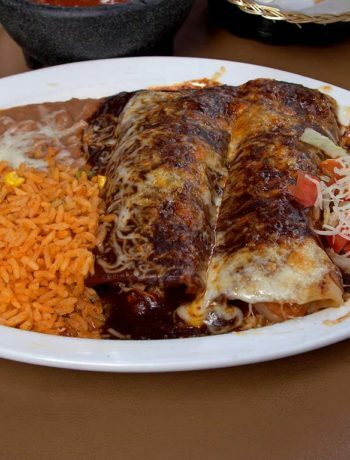 Beef isn’t essential to making a great enchilada or taco, but I chose it, as it is my favorite filling ingredient. Beef connects most for me as the ‘go to’ filling for enchiladas or tacos and this recipe is spectacular. 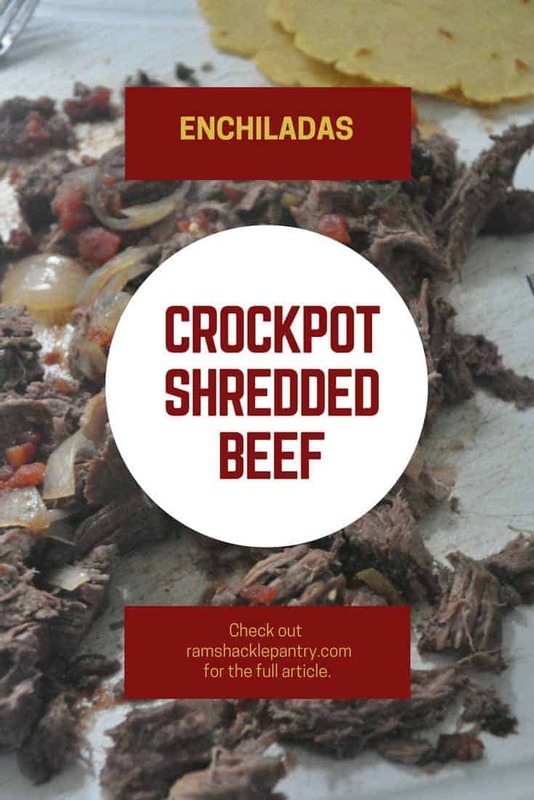 Make sure to check out this Slow Cooker Beef recipe. This recipe could really be used for any Mexican dish. I tested this on enchiladas and tacos, but it could add flavor to many other Mexican recipes. 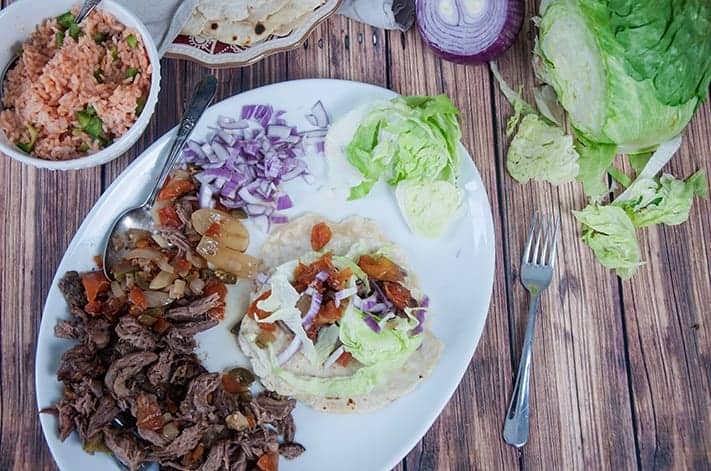 I originally wrote this recipe early on in the blog, and now that we are spending some time on the taco, I thought it would be an excellent time to revisit this delicious beef recipe. Today, we are focusing on the shredded beef for enchiladas and for tacos. A crockpot or slow cooker is a great tool for making super moist, tender, meat for shredded beef enchiladas. 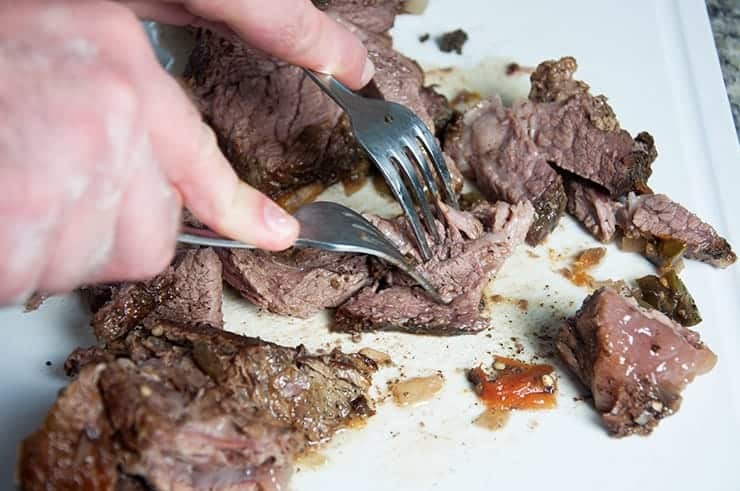 Slow cooker meat can turn out dry, but if you do it right, you can get some very tender meat. 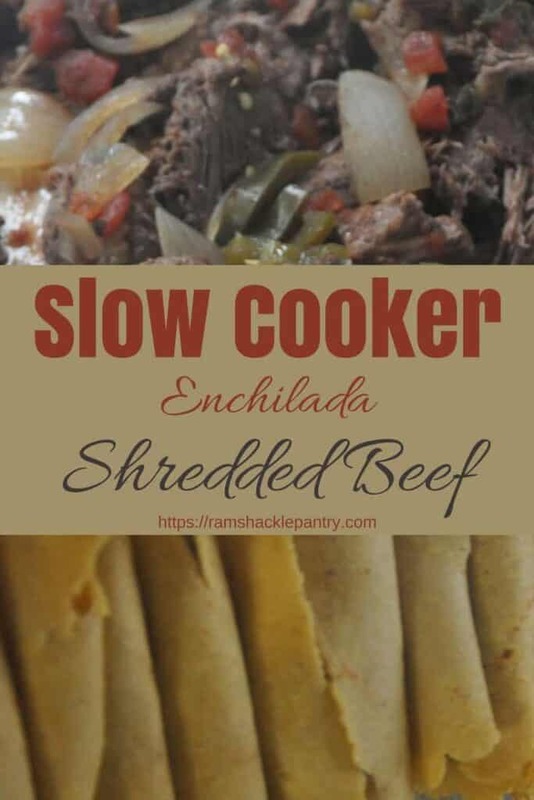 Choosing the right cut of meat and cooking low and slow are essential for great shredded beef enchiladas from the crockpot. 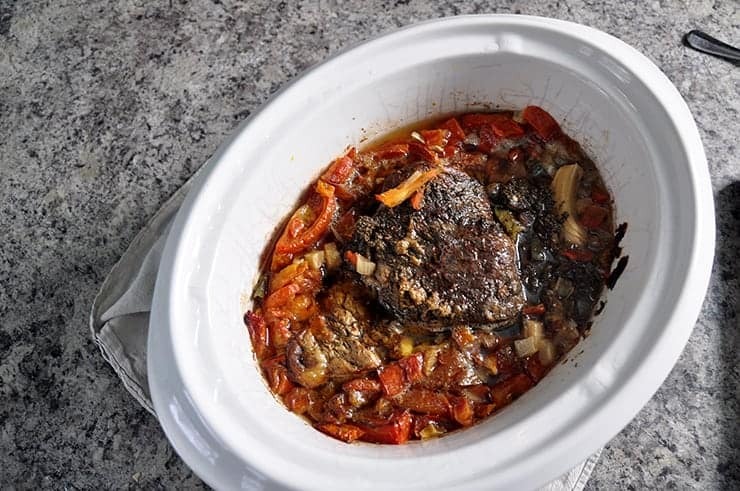 I adapted this recipe from The Magical Slow Cooker recipe and they called for 4lbs of beef chuck roast for 8 servings. I made the full 4 lbs on my first go around and it tasted awesome. There was, however, quite a bit of meat. 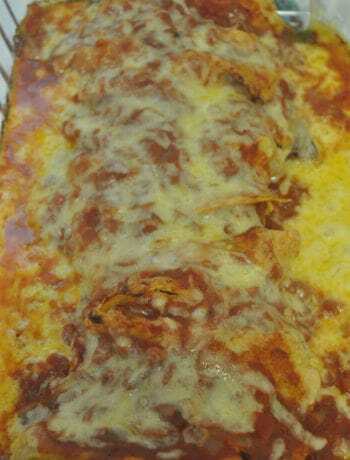 My feeling was that it made much more than 8 servings (16 enchiladas) for a baking sheet of shredded beef enchiladas. Even for our tacos, a decent amount of beef for a taco would be 2 ounces and this seems like way too much for the amount of tacos that we are making. All of the ingredients in the slow cooker before we start heating the roast. Cooked roast in the crockpot just prior to shredding the beef. In the process of shredding the beef. On my second go around, I used a roast that was 2.3 lbs. For the 12 enchiladas I made, I feel that was plenty of meat. Assuming 2 enchiladas was a serving and a serving size of meat is 3 oz, this adds up fairly well. 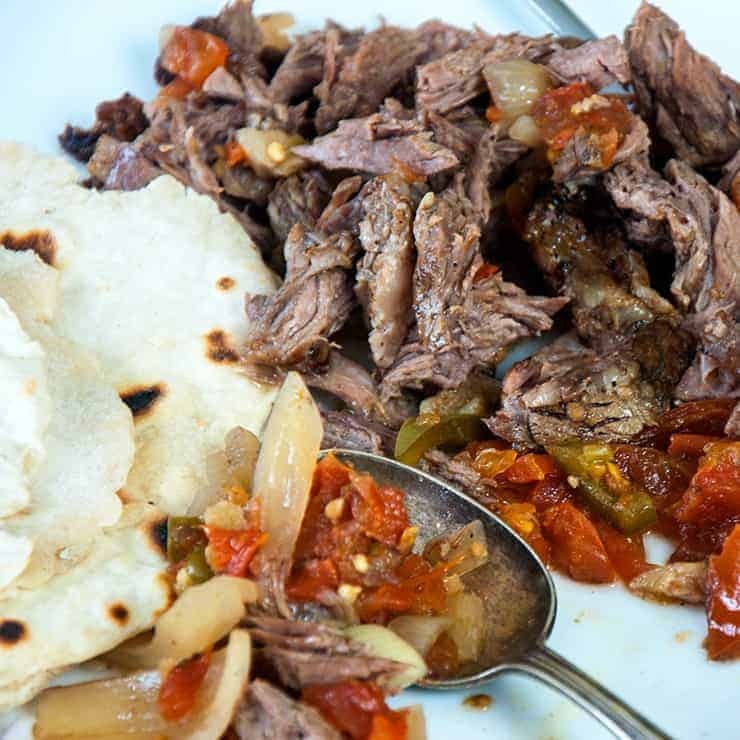 It certainly is enough for our corn tortilla recipe and our flour tortilla recipe if you are using this beef for tacos. Every time I executed and fine-tuned this recipe, I was delighted. Not only is it easy to simply prep the meat and let it cook all day, but it makes for some great shredded beef enchiladas. It serves well for taco recipes as well as our shredded beef enchiladas recipe. Man, oh man, does this look !!! I love that you can make it in the slow cooker. I’ll bet the house smells amazing while it’s cooking! House smells sometimes make a great recipe, right?